How Does Probate Affects Tenants-in-Common Property? Holding title to property as tenants in common can't typically avoid probate, at least not without a little help. If your loved one has died and you owned property together as tenants in common, certain laws and rules determine who will inherit his ownership interest. Probate is the legal process of transferring ownership of assets from a deceased individual's name into the names of her beneficiaries. Probate also ensures that the decedent's creditors can make claims for payment of her debts and that her final tax returns are filed, including an estate tax return if her estate is large enough. All this can take some time and there's some expense involved, so many people plan their estates to try to avoid probate to the greatest extent possible. A tenancy in common is a form of property ownership between two or more people. The tenants don't have to have equal ownership interests—one can own a 25% share in the property while the other holds 75% ownership. They're both entitled to the use of the entire property regardless. Unlike with some other forms of property ownership, tenants in common are free to sell or transfer their shares to other people without the consent or permission of the other tenant or tenants. Each tenant reserves the right to include his share of the property in his estate plan, leaving it to anyone he likes when he dies. This type of ownership is common among unmarried individuals when one contributes more financially to the property than the others. His percentage ownership in the property is typically commensurate with his contributions, so he has the right to transfer that interest to someone else during his lifetime or after his death. A joint tenancy is another common way to hold title to the property, and this type of ownership does avoid probate because it carries rights of survivorship. This means that when one tenant dies, her share of the property transfers directly and automatically to the surviving tenant. There's no need for a probate court to get involved in the process. Joint tenants hold equal shares of the property. If there are two of them, ownership is 50/50. Neither can sell or encumber their share of the property without the other's cooperation and consent. 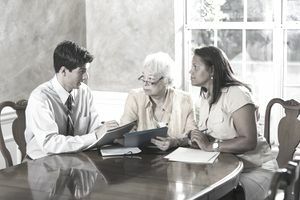 If one should try to pass his share of the property to someone else in his estate plan, the survivorship rights inherent in the title would trump and eradicate the bequest. This situation may seem impossible on the surface. How can a jointly-held property such as a tenancy in common be held in just one person's name? It can't—but the deceased's ownership interest can be. If the decedent's share of the tenant-in-common property is titled in his name alone, his ownership interest in the property will pass through his probate estate in one of two ways. It will go to the beneficiaries named in his last will and testament if he left a valid will. His portion of the tenant in common property would pass to the beneficiaries he named to receive it. Otherwise, it would go to the decedent's heirs at law. These are individuals who stand to inherit from a decedent in the absence of a will. Although it varies by state law, spouses and children are usually first in line to inherit. If the decedent failed to make a will, his portion of the tenant-in-common property would pass according to these rules, called laws of intestacy. Which state law will govern? If the tenant-in-common property isn't real estate, the intestacy laws of the state where the decedent lived at the time of death will govern. If the tenant-in-common property is real estate, the intestacy laws of the state where the real estate is located will govern, even if they're different from the laws of the state in which the decedent died. The bottom line is that if you hold title to the property this way, you will end up with a new tenant—whoever inherited the other tenant's share. You could find yourself owning property with a complete stranger. In a best-case scenario, he bequeathed his share to you. You now own the entire property, just as you would in a joint tenancy with survivorship rights...but this transaction would be subject to probate. The decedent's portion of the property will pass to a living beneficiary outside probate if she formed a revocable living trust and titled her portion of the property in the name of the trust. In this case, her share of the property would go directly to the beneficiaries named in her trust documents. This isn't a function of the tenants in common deed. It's a function of the living trust. Revocable living trusts avoid probate of all their assets. A mortgage is a debt, and the probate process addresses a decedent's debts. But the decedent's estate would not be responsible for paying off the mortgage if the loan is in joint names. In this case, consumer law trumps probate law. Both tenants were contractually bound to pay the mortgage. If only one of them survives, the entire contract obligation automatically shifts to the survivor by operation of law. But if the decedent held a mortgage in his sole name for just his portion of the property, his estate would be responsible for paying it or otherwise resolving the situation. This could potentially involve a forced sale of the property by either the estate or by the lender if there aren't sufficient funds in his estate to settle the mortgage balance. The whole process can become complicated with various parties concerned with protecting their own interests. You obviously don't want to lose your home, but you might not want to own property—or live with—whoever inherited the other tenant's share. If you're not stuck on living there yourself, you might be able to reach an agreement with the new tenant to sell the property. Everyone could take their rightful shares of the proceeds based on their ownership interests, or you might be able to buy out the new tenant's interest or find someone else who is willing to do so. Absent such an agreement, you could file something called a partition action in court, asking a judge to force the sale of the property and pay each of you your respective share of the proceeds.